I was quite skeptical and continued my self-taught ways of golf swing deconstruction until it was clear to me that no progress was being made on improving my golf game and that outside help was the only way out of my quagmire. I found Mr. Hathaway’s phone number in my PDA and scheduled an appointment. From the outset, it was clear that B. J. has profound understanding that every golfer has a unique formula for swinging a golf club, and he saw mine immediately. My improvement was evident after the first lesson, but perhaps the most impressive quality of his instruction is that my practice sessions are now so much more productive. I can see my progress in terms of swing consistency, distance and accuracy during my practice and play from every club in the bag. I liked the way he respected my style and at the same time corrected my bad habits. That way I didn’t have to spend much time struggling to adjust to the new way. He tried to have me think rather than merely giving his advice. I’m seeing a difference in practice and hope it will on the actual course as well. Great lesson! Finally got a minute to write and thank you for a great golf lesson. You are tops in my book. I enjoyed the whole experience. Lots to work on and your follow-up videos will allow me to do it the right way. Can’t believe how Stack and Tilt gave me my game back. Confession: I’ve had total hip replacement (both hips) and right shoulder replacement…I’ve never hit the ball more crisp…or farther. Gonna move my 11 handicap into the single digits no problem. Wish you were closer. I met with B.J. Hathaway in November of 2011 for the first time and since then my game has taken a leap towards a level I never thought I could reach. The techniques and fundamentals that he has taught me made my swing more consistent and beautiful. It was not only the things he taught me, but more how he teaches it. B.J. will always find a way to engrave the correct paths and positions into your swing so you can understand and feel the correct movements. He has made my swing look and feel the best it could be. Not only did he show me the correct movements and positions for my swing, but he also teaches me how to apply it in practice and in competition. Since I have worked with B.J. my swing is more consistent and I have control over my ball. B.J. has made my swing better and put my game to the next level. From beginner to A player, BJ is the most qualified and respected golf instructor in town. I have known BJ for about five years now and have worked with with him many times. The first thing I noticed is that he is not a “generic” teacher. He takes the time to evaluate each and every person he teaches so he gets the “whole” picture of who he is dealing with. We all know that golf is not just about the “swing”. Its about the person’s hopes, beliefs and confidence behind that golf swing that enable us to become better players. That is what BJ is all about. He is not trying to turn you into a tour pro, rather he is giving you insight into what can make you a better player so you will enjoy the game more. That is if you listen and apply what he teaches you, and that is the mark of a great teacher. He wants you to be the best that you can be. I believe that BJ is more beneficial to the average player than a week with one of the “celebrity” coaches. Plain and simple–He Cares, you are not just a fee! I appreciate people of BJ’s integity and I will always believe that B J Hathaway has truly chosen his profession well. He’s good at it and he cares. What more can us duffers want? “I started golf three months ago, as a beginner I had different instructors. With the other instructors I often lost interest in golf because of repeated movements or having to repeat the same thing over and over. After meeting B. J. my perspective of golf has changed. Not only has he understood my personal style but he also taught me to develop my own swing. I was having great difficulty with a slice, he immediately knew the cause and the correction. His teaching is logical and based on science and uses interesting teaching aids. He helped me develop a swing that fits me instead of copying someone else. Are you a beginner in golf? I would advise that you meet B. J. as soon as possible, he helped relieve the stress my golf game was causing and now I much more enjoy the game that I love! Thank you B.J. for being my friend and teacher. Thanks for the video and feedback. My coach hasn’t used video, so your video analysis is really eye-opening to me (particularly the angle of the back swing, which I have never thought about). I really enjoyed the lesson. Leah’s golf game has taken a turn for the better, as she practices the techniques taught to her by Mr. Hathaway. We look forward to continued sessions in the future. This was my second lesson with BJ and He has already helped me take strokes off my score and build confidence in my abilities. I can’t tell you how much positive help I’ve received with your lessons. Simple things I had not even thought of had gotten in the way of improving my game. Instead of progressing I was regressing over the years. With your help I have actually started to improve in both ball striking and putting. The methods you use make since and easy to follow even for a thick headed golfer like me!! Coach Hathaway is a special coach.He not only fully understands and comprehends the fundamentals of the game of golf but also knows how to apply the principles especially to those, like myself, who took the game up very late in life and don’t have the dexterity of youth. That I love the game so much is in no small measure due to Coach Hathaway. B.J. had me rehearse “over & over” the incorrect swing I’d used for 30 years to understand why I so drastically slice all irons and woods. Then he instructed and coached me on a proper swing, which totally changed my game. Now, on the course, when I hit a bad shot, (instead of just getting mad at myself) I can reflect on what caused the ball to go the “wrong way” and know what to do to get back on track. Understanding this IS my new “bag of tricks”. Great style of teaching! I have really enjoyed all of the insight into Hogan’s swing and the history behind it! However, it seems everyone and his friend is suddenly a Hogan pivot expert! Keep up the good work, thanks. Keith. Mr. Hathaway is very easy to work with. Stern when need be, yet very professional in his own way. All about your progression!! That’s why I will return time after time. Whether your a novice or low handicap player. BJ has the true answer to your game improvements. From lesson one you gain a ton of info in such a short amount of time. After my first “gift” lesson from my wife, I realized the benefit of BJ’s expertise. After each of many lessons since, I received a video that memorialized each session. 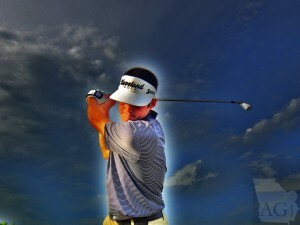 These videos have proven invaluable when needing to go back and “fix” my swing. Although I haven’t needed a tune-up for some time, I know that Coach Hathaway will take good care of me when the occasion arises again. I encourage anyone who wishes to improve their game (greatly) to commit to a “lesson” plan and stick to it. I did it for nearly a year, and it has proven to be the best investment I’ve ever made in myself! I will always be grateful for the superb instruction of Coach BJ Hathaway.